Kujo, Ooe-cho. Fukuchiyama City, Kyoto Prefecture, Kinki Region, Honsyu Island, Japan. These are a wonderful specimen in Japan in addition to Kujo. Discrepancy stone is the uncommon stone which is contained in the conglomerate layer. The pellet did a fracture first and then it differed and it glued together again after that. The origin of discrepancy stone is generally at present thought of as follows. The cause which the pellet differs from is a fault, and the cause to glue together again is dissolution by the frictional heat in case of the discrepancy. However, I think that such a phenomenon will not be able to happen when it is natural. The discrepancy stone which is in the outcrop. The broken-out section of this discrepancy stone is not a fault plane. Therefore, the cause of the discrepancy is not a fault. The fault which is in this outcrop. In case of the fault, the discrepancy is big and it seems that it is rarely possible to glue together again. Moreover, even if this discrepancy occurs, the dissolution by the frictional heat, too, isn't occurring. If the discrepancy cause is not a fault, what will the cause be? 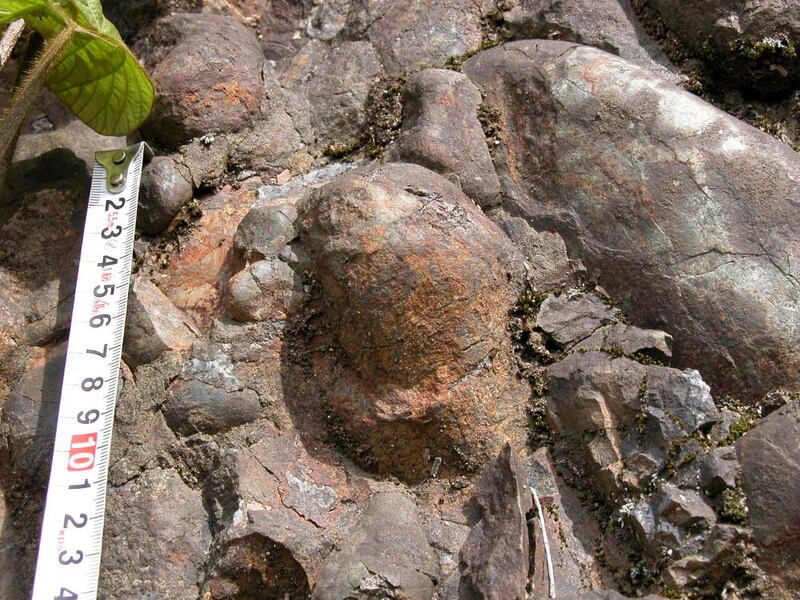 Conglomerate is composed of various particles with size such as clay, sand, the pellet, the organic matter, water, gas. 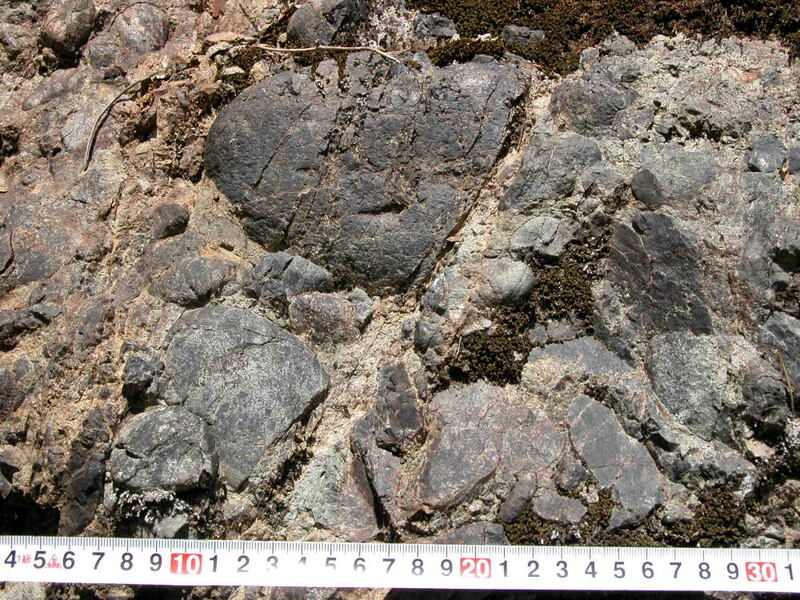 When the pellet accumulates, the sinking pressure occurs in the conglomerate layer of course. The distortion generates each particle in each place in the conglomerate layer,because, as for each particle, the shrinking percentage be different and then because gas and liquid have run away. Also, with the principle of the lever, the break-power sometimes becomes big. 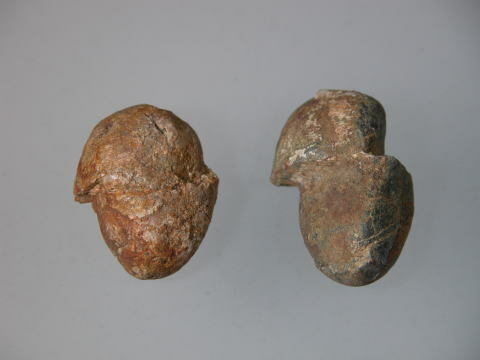 When the two pellet fellow presses each other, the pellet of the one becomes the fulcrum of the lever and the other pellet does a fracture roughly. Then, when a time is the fracture of the pellet? I think that the time when the pellet did a fracture is the time to be early comparatively after the conglomerate layer acumulation ending. 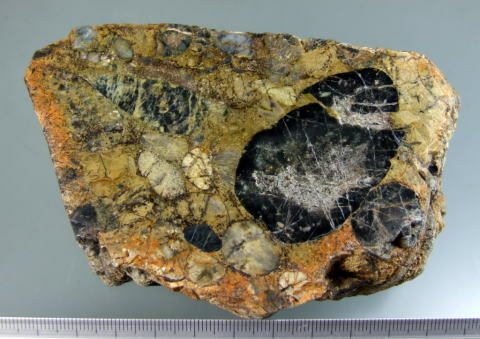 The cutting specimen of the conglomerate. The pellet which is contained in this differs separately a little,moreover, the interval of each of the pellets which did a fracture is filled with sand. This phenomenon will not be able to happen by all means after the diagenesis completes. I thought of the origin of discrepancy stone as follows based on these objective evidences. 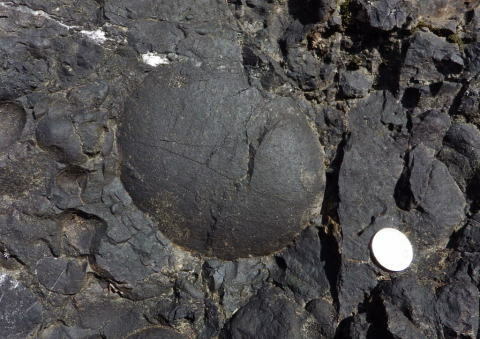 When a conglomerate layer is accumulated, with the sinking pressure, the distortion occurs into the layer. The pellet is a fracture with this tension. Then, by the diagenesis after that, the pellet which did a fracture glued together. In this, it completed discrepancy stone.